By using preventative home care strategies you, the pet owner, can significantly decrease the chances of your pet developing recurrent dental diseases. Home dental care is very important for the health of your much-loved companion. Statistics show that 70% of cats and dogs over the age of three years have some form of dental disease. Regular veterinary exams, along with regularly practised home care strategies will keep your pets’ teeth healthy and significantly reduce the incidence of periodontal disease. The most effective way to remove plaque from the teeth is through regular brushing. 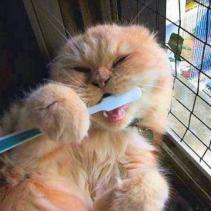 It is important to use a tooth brush and paste specifically designed for pets. The foaming agents, flavours and fluoride in human toothpaste can make a pet feel sick if swallowed. Make contact with the surface of each tooth using up and down and circular motions. Some pets prefer the use of an electric toothbrush, which can also make your job easier. Daily brushing is the gold standard but every second day is acceptable. Any less frequent, and minimal benefits are seen. Diet plays an important role in managing dental health. 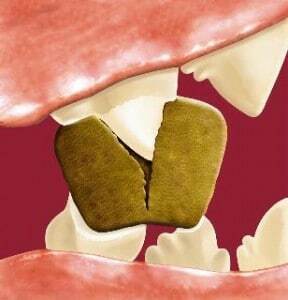 Abrasive foods can help reduce plaque / tartar accumulation. Some foods are designed to scrape the tooth surface during chewing e.g. Hills Oral CareTM, Hills t/dTM diet, Royal Canin DentalTM diet, whilst others are coated with substances that reduce mineralisation of the plaque and reduce tartar formation e.g EukanubaTM dental defense system. Ideally using a diet that is endorsed with the VOHC (veterinary oral health council) seal of approval will see maximum benefits. If your dog (or cat) cannot be trained successfully to allow regular brushing then dental chews are the next best option for reducing plaque and preventing periodontal disease. Many different chews are available BUT they are not all created equal! Some have proven claims that show through rigorous scientific trials that regular use actually makes a difference to dental health. It is ideal to choose a chew / treat that has the VOHC (veterinary oral health council) seal of approval so that you can have full confidence in the product. 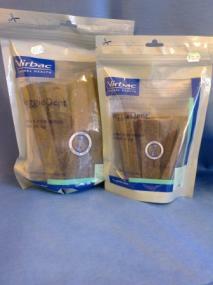 Daily or every second day use of such chews / treats is the recommended frequency of use. 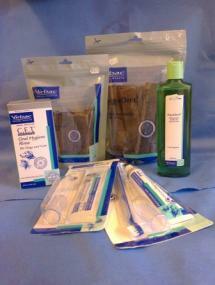 An example of a VOHC approved chew / treat is Virbac’s Veggiedent®. Many of the smaller breeds of dogs, and cats are not big fans of chews / treats. In these patients using a post meal oral Gel has proven to be very effective at reducing plaque formation. 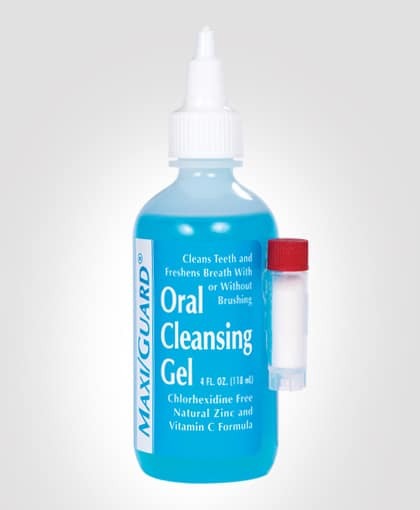 We stock Maxiguard Oral Cleansing Gel®. 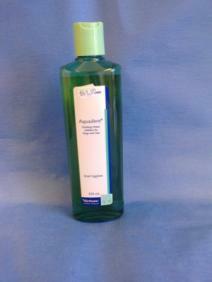 This is a non-chlorhexidine based gel containing Zinc Ascorbate. The natural ingredients help reduce gingival inflammation, reduced plaque deposition on teeth, and neutralises offensive mouth odours. The gel is applied along the tooth-gum margin after each meal and comes. Visit Addison Labs for more details. Aquadent® is available for adding to the drinking water of pets. This can be considered similar to humans using a mouthwash. 5ml of product is added to 500ml of water. Fresh water should be made each day with any remaining product discarded. Like most things in life, the more effort that is put into developing and maintaining a regular homecare strategy for your pet’s dental health, the greater the reward will be. The greatest reward will be a clean, healthy and pain-free mouth for your beloved friend.